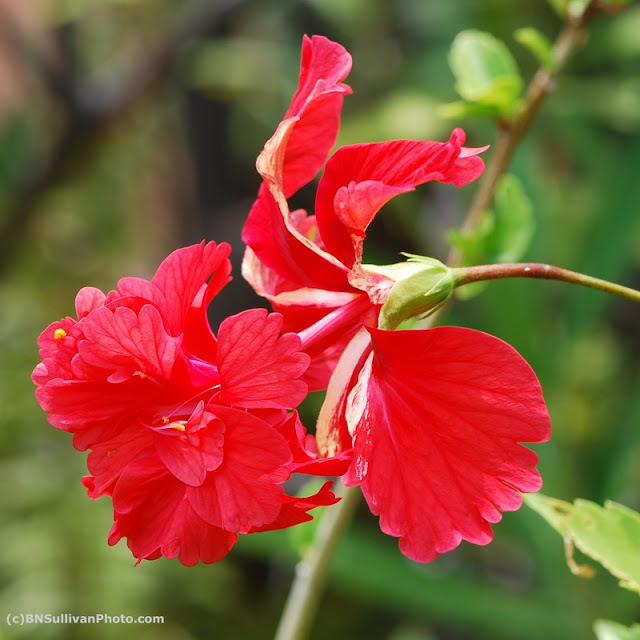 Now that I am back home from my holiday travels, I would like to offer this flower photo -- a Hawaii Belle hibiscus -- to wish all of my readers a bright, happy, and colorful 2009. Wow, that is soooo pretty! Great capture too. You got that kind of background blur at f/10.0? Niiice. Is that a macro lens (or one with a macro setting)? Is that how you did that? Or was it just the 105mm focal length on a close up subject? Either way, it's a very striking capture. What a bright and cheery flower. Jusy perfect for a gloomy and snowy day here. Thanks, and glad you got home safe. She is a beauty! Glad to see you back - hope you had a great time! @ 2Sweet -- Thank you, and Happy New Year to you as well. @ Mojo -- Thanks. Yes, the Nikon 105.0 mm lens is a dedicated macro lens. It is a superb lens, well worth the money that you have to save up to get it!! @ Becky -- Glad I could brighten your "gloomy and snowy day" with a tropical blossom. @ Kathy - Thank you. Yes, it was an enjoyable trip -- thanks for asking -- but it's always good to get back home! What a beautiful bloom - like a lady dancing in a full, ruffly skirt!